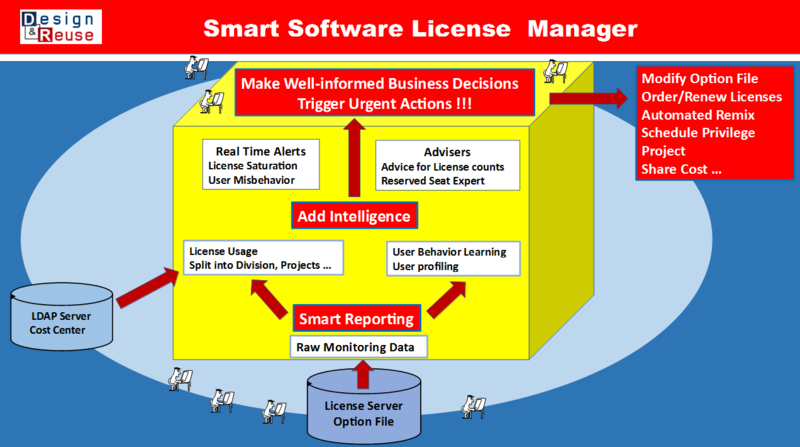 D&R announces the first "Smart Software License Manager"
D&R extends capabilities of its Global corporate IP Management System (IPMS) with "Intelligent Advisers"
Managing global and local resources in a large company can be a headache when based on individually managed spreadsheets. Having fully integrated data in a web based tool is the only way that makes sense today. D&R Enterprise platform is a new generation management platform based on powerful innovation and has proven amazing efficiency for managing in a large corporation not only IPs but today software licensing across multiple sites. By connecting and keeping in Sync such items as user groups, their SW configurations and costs, SW feature names, and their license servers opens the door to being able to make costs saving decisions. It includes a monitoring layer reporting on License Feature usage per customizable period (average, peak, denied access, etc.). But it is more than just monitoring... Incorporating these data in a global administration portal gives the required global view for optimizing License Management and allowing for cost saving decisions. In large companies it is a challenge to centrally manage dozens of tools at dozens of user sites and cost centers. D&R platform adds to an efficient corporate Ecosystem description: machines, users groups, SW products, business unit cost, etc. the relevant interconnected web views. "We have used & helped develop this platform for years. It is hard to imagine going back to emails & spread sheets to collect our various business group needs and divvy up the costs. The tool has digitized all our data, has integrated usage monitoring & is about to release further automation to help advise us to optimize license counts. It is truly a one stop shop for efficient license management." "We follow this platform development for years. Integrating tightly user profiling makes a big difference and cost reduction brought by intelligent business decisions is significant." - Beny T. from Rafael Inc. an early architect of the platform. "Learning User behavior when using web hosted Products is quite amazing... AI rules or advisers can be derived from this knowledge harvesting and lead to intelligent decisions which drastically optimize Purchase, Sales and Business strategy. This platform can certainly open many other applications"
Join a local seminar close to your office ? Ask for a webex ? Ask for a visit at your office ? Various types of products (IP, models, software, mechanical parts...) that can be internal products or externally outsourced from several vendors. How to promote internal IP Reuse by creating a centralized IP repository for decentralized teams using different revision control systems? IP Packaging and IP repository management are a part of the D&R IP Management Platform. Our IP Repository stores IPs under revision control. IP Packaging system provides bridging interfaces to designers native revision control system. Does the platform propose best design practices in place? IP Packaging interface communicates and enforces Best practices. containing your management data easily accessible in the product web catalog for your sales team. License Request Management for worldwide products (IP and Software) within corporate agreements for supplier products in the name of all decentralized corporate divisions aims at saving designer’s time thus increasing their productivity as well as controlling budget and license costs. Directly connected to the External Supplier catalogs, license requests are controlled by managers through license request panels and the workflow of approvals is optimized across the corporation. The status of licenses requests and licenses running all over the geographical centers is displayed at the management levels and cost saving by license sharing becomes straightforward. Ordering a set of products is handled as a hierarchical set of license requests (IP and software) and follows the same workflow than basic licenses.